Guptas’ troll armies trying to infiltrate Orthodoxy? Some time ago I started a Facebook group for Orthodox Christians in South Africa to share news of events and happenings, so that people could learn about things that were happening in parishes other than their own. Last week there was a flurry of requests from people wanting to join the group. Most of them were from outside South Africa, though they appeared to belong to several other Orthodox groups on Facebook. Eventually I posted a request in some of those other groups asking that people not ask to join the Orthodoxy in South Africa group unless they had personal connections with the Church in South Africa, otherwise the South Africans in the group would soon be outnumbered by people from other places. There are plenty of worldwide groups they could join. Some people from other places have joined the Orthodoxy in South Africa group and then post little devotional articles, which you then see several times a day, so that every Orthodox group on Facebook looks just the same, and you can’t see the real news for the padding, and eventually no one bothers to put any real news up at all. For example, I heard rumours of a monastery being started in South Africa, but nobody said anything, even though several members of the group probably knew about it. That was real news, so why did no one in the group see fit fit to mention it? Why didn’t anyone post photos of it? Yet people post photos of monasteries on the other side of the world. The extraordinary emails released on Sunday by both the Sunday Times and City Press have once again cast a light on the role played by British PR firm Bell Pottinger. The firm dropped the family as clients last month in the wake of protests against their company for allegedly driving the attempt to repair the Gupta family’s image in South Africa. Could it be that Gupta’s troll armies are trying to infiltrate our Orthodoxy in South Africa group? You’ve got to wonder when someone who asks to join says they live in Venezuela and come from Arizona, and belong to several Orthodox groups and 679 other groups on Facebook. No one who joins that many Facebook groups can be legit, and I’m sure they don’t want to join the Orthodoxy in South Africa group- because they want to know about Benoni parish’s panigyri or the open day at Saheti School. It does make me wonder why they are members of all those other Orthodox groups as well. Remember the 1990s TV series Pinky and the Brain, where in every episode they were planning to take over the world? Maybe Bell Pottinger have already taken over the world. Maybe they planted these trolls in all those other Orthodox groups on Facebook as well. In South Africa Bell Pottinger came up with the phrase “white monopoly capital” as a diversionary tactic to try to take people’s minds off the dangers of Indian monopoly capital, where the Gupta family had their fingers in every pie. The ran a campaign of promoting naked racism, deliberately trying to stir up racial hatred in South Africa because they were paid by the Guptas to do so. Maybe all this is turning me into a paranoid conspiracy theorist, but never forget the old adage: just because you’re paranoid it doesn’r mean that they aren’t out to get you. This is a strange rhetorical question that I’ve been seeing with increasing frequency on the Internet. A Google search showed about 259,000 results. And it seems strange because if you read what people write about it, a lot of them seem to think that outrages are a good thing, and that they are deploring their absence. Or people will describe an outrage, giving the details of its exact location, and then ask where it is. And the answer, of course is right there, in Gotham City. They just said so. So it seems that people don’t really know what “outrage” means, and seem to think it means the same as “rage”, but is enhanced by adding a prefix — inrage, outrage, uprage, downrage. Just as people think one can enhance “centre” by putting “epi” in front of it, or “record” by putting “track” in front of it, and some even seem to think that “ultimate” can be enhanced by putting “pen” in front of it. “Outrage” actually means “the forcible denial of others’ rights, sentiments, etc” or “an act of violence”. When police shoot an unarmed person who is not breaking any law, it is the shooting itself that is the outrage, not the emotional reactions of people hearing or reading about it. An outrage is never a good thing. But even if it is a malapropism, and if people actually mean “rage” when they say “outrage”, is it a good thing? It is something I’ve seen asked on Christian websites and blogs and social media, and there’s quite a good answer here Where’s the Outrage? | ifaqtheology. Rage is often the cause of outrages; we often read of incidents of “road rage” where an enraged motorist assaults or sometimes murders another. Is that a good thing? Recently Time magazine had a cover showing an Orthodox Church descending on the US White House and assimilating it. Some Orthodox Christians were asking “Where’s the outrage?” about that. Well, quite clearly the outrage was on the cover of Time , but I think what they meant was “Why aren’t more people enraged by this outrage?” And the implication was that they thought more people ought to be enraged by it. There are many things in the world that tempt us to let our passions rage unrestrained — Facebook, for example, has recently added an “anger” button which you can click if something enrages you. I try to avoid using it, because it is a temptation to indulge in the passion of unrestrained anger. If you find the Time cover outrageous, by all means say so, but try not to get enraged by it. One can point out that it displays ignorance and is irresponsible journalism, and hope the errors might be corrected. But indulging in emotional outbursts of anger doesn’t achieve anything. I think that Donald Trump is far more influenced by Pseudo-Evangelical Moneytheism than he is by Orthodox Christianity, so the Time cover is misleading, to say the least. But don’t get all worked up about it, and demand that other people get worked up about it too — to do that is simply to indulge the passions. And do try to use words like “outrage” accurately (yes, I’m an Orthodox language pedant). Are Roman Catholics and Orthodox about to unite? Of course, it is difficult to objectively detail influences Orthodoxy has had on Roman Catholicism. Very often an individual or a small group of individuals may have contact with Orthodoxy, digest certain things which they discovered, and incorporated them into the life and thought of their communion, generally without the knowledge of the Orthodox. Last May I encountered a Roman Catholic priest from France who operates a school for young adults interested in missionary and evangelistic outreach. He gave me a copy of the school’s magazine, which sported photographs of the school’s chapel, the interior of which was completely frescoed in Byzantine iconography. Other pictures revealed another small chapel filled with icons, as well as the priest himself in Orthodox vestments celebrating the Eucharist. Odd as all of this might be — imagine how one would react to find an Orthodox church in which the Sacred Heart statue was prominently displayed! — it does show that, in many ways great and small, Orthodoxy has had some influence, even if it is only external. The last point, about the Sacred Heart, indicates, however, that there is still a very long way to go. 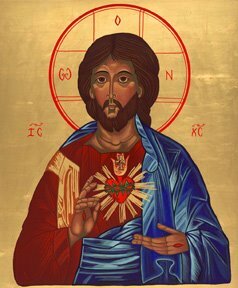 Why is it that, as an Orthodox Christian, I find this Byzantinised image of the Sacred Heart (found at Clerical Whispers: Prayer To The Sacred Heart) quite shocking, and almost a desecration? I don’t mind if Roman Catholics use Byzantine ikons, but this image strikes me as abuse rather than use. It indicates that the gulf is much wider than we think. Unity is a lot more than Orthodox and Roman Catholic bishops visiting and being polite to each other. I’m all in favour of them doing that, and even doing the same thing with Anglican and Zionist bishops, but it doesn’t mean that reunion is imminent. Some think that it is only a few minor theological issues that can be sorted out quickly. But it’s not just papal primacy and the Filioque that keep us apart, but a millennium of history. We differ in soteriology (Anselm’s theory of the atonement, which swept the west, never got much traction in Orthodoxy), ecclesiology (the Orthodox temple versus the Roman monolith and the Protestant heap of stones) and missiology (Roman missiologists believe that Orthodox missiology is derived from Origen). All these have led to a different culture and ethos, and this is just as much theology as the kind of theology that is written in books. And so before there can be any reunion, these things must be faced and examined. 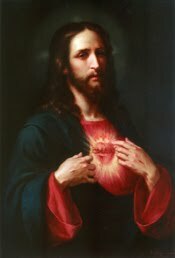 So if Roman Catholics want to have images of the Sacred Heart, I think it would be better if they stuck to ones like the one on the left. Unlike some writers, I don’t think a hasty marriage is imminent. We are far closer to the Oriental Churches, like the Copts and Armenians, than we are to the Roman Catholics, and I don’t see reunion happening there very quickly. I’ll believe it when I see an agreement that the next Pope of Alexandria to die will not be replaced, but that the other one will simply move in to succeed him and that thereafter there will just be one. But I see no sign of that happening yet. Yesterday I had to take my son Simon to work in Johannesburg, and went to St Thomas’s Church in Sunninghill where the Pope and Patriarch of Alexandria and all Africa was paying a visit. After a service in the church, the Patriarch had lunch with some of the parishioners. One of the contrasts between Orthodoxy in America and Orthodoxy in South Africa is that in South Africa there is not the same ecclesiastical apartheid that one finds in America. St Thomas’s is largely a Serbian parish. The parishioners are, for the most part, Serbian immigrants and their descendants, and they use the Serbian language in their services. But the Antimension on the Altar is signed by His Beatitude Theodoros, Pope and Patriarch of Alexandria and All Africa. People of all races and ethnic groups are welcome at St Thomas’s, and one of the gifts presented to the Pope by Archimandrite Pantelejon was a picture drawn by his 7-year-old niece in Serbia, showing her uncle baptising black children in Johannesburg. Some of those who regularly attend St Thomas’s are black South Africans from Klipfontein View, who used to belong to Tembisa, but find it easier to get to St Thomas’s. The picture shows Pope Theodoros II with Archimandrite Pantelejmon, the Rector of St Thomas’s Church. 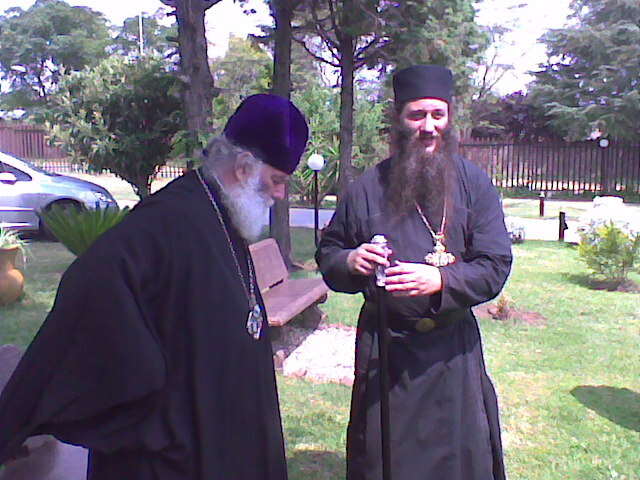 The Archbishop of Johannesburg and Pretoria, Metropolitan Seraphim, says that we should not refer to the “Greek Orthodox Church”, but rather “The Orthodox Church of South Africa”, or the “African Orthodox Church” because though there are Greek, Russian and Serbian parishes in the archdiocese, which maintain ethnic traditions and have services in those languages, the Orthodox Church is one church. So while the Patriarch visited St Thomas’s, he was shown a classroom attached to the church hall, which is a Serbian School, and children are taught the Serbian language and history, and he approved of it. But in spite of the variety of ethnic groups and traditions, we are still one Orthodox Church, under one bishop and one Pope and Patriarch, and nobody asks the question, so common among Americans “What juridiction are you?” In South Africa, thank God, that question is meaningless. Every year a different bishop from Serbia visits St Thomas’s for their patronal feast in October, but the visiting bishops are always given a formal reception by Metropolitan Seraphim at the Metropolis as well, and Metropolitan Seraphim makes a point of atending at least part of the celebrations of the patronal feast (panigyri). 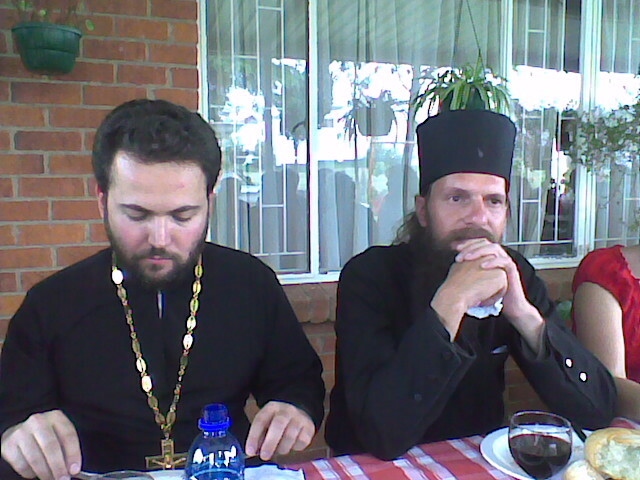 Among the guests at lunch yesterday were Father Daniel, the new priest of the Church of St Sergius of Radonezh in Midrand, and Fr Seraphim (in the world Matthew van Niekerk), the first South African to be tonsured as a monk in South Africa, who is at the moment caring for the Greek parish in Klerksdorp. And Judge of the Universe, Many Years! Last Sunday was the 4th of 13 in my sabbatical time. Each of them is precious to me. Each week I am choosing a place and a way to worship. I’m not a church tourist, hoping to see new things. I’m seeking spiritual experiences. I want to worship. Saturday night Jeanene and I still hadn’t decided where to go. I experienced something common to our culture but new to me. The “Where do you want to go to church – I don’t know where do YOU want to go to church” conversation. I found the Saint Anthony the Great website. It’s an Orthodox church that has beautiful Byzantine art in the sanctuary. We decided to go there. I’ve been reading blogs where people discuss “attractional” versus “missional” churches, and have struggled to make sense of these terms. They just don’t seem to fit my understand or experience of church. And, perhaps this real live preacher ‘s experiwnce can give a clue about why “attractional” versus “missional” seems such a false dichotomy. This one has been doing the rounds on Facebook. Saturday 7 February 2009 is visitors night at St Nicholas of Japan Orthodox Church in Brixton, Johannesburg. Here are some notes to help visitors know what is happening. Vespers begins at 6:30 pm on Saturday, but is actually the first service of Sunday, so the themes of the hymns belong to the Sunday. Granting life to the world. Glory to Thy Resurrection, O Christ! Glory to Thy dispensation, O Thou who lovest mankind. This Sunday marks a transition – the feast of the meeting of Christ in the Temple (Feb 2nd), forty days after his birth, looks back to Christmas. The Sunday of the Publican and Pharisee looks forward to Great Lent, which begins with Vespers on Sunday 1 March, which is known as the Vespers of Forgiveness, where all members of the congregation ask and offer forgiveness to each other. You will notice that the prayer of the Publican, Lord have mercy, is very prominent in public Orthodox worship. In private prayer it is often expanded into what is sometimes called the “Jesus Prayer”: Lord Jesus Christ, Son of the living God, have mercy on me, a sinner. The core of Vespers goes back to the Old Testament: “When Aaron sets up the lamps in the evening, he shall burn it, a perpetual incense before the Lord from generation to generation” (Exodus 30:8). O gladsome light of the holy glory of the immortal Father: heavenly holy blessed Jesus Christ! Now that we have come to the setting of the sun, and beheld the light of evening, we praise the Father, Son and Holy Spirit. Therefore all the world doth glorify Thee. For he has established the world so that it should never be moved! Holiness befits Thy house, O Lord, for evermore! Followed by intercessions and led by a deacon, after which it is sung again, interspersed with hymns (Aposticha) on the themes of the day. If you don’t have time to read them all, at least try to read the first one. If you scroll down on the sidebar of this blog you’ll find a list of “Top theology blogs”. It’s interesting, but there are very few Orthodox blogs listed there, and I thought I’d create a list of Orthodox Christian blogs, and added some of my favourite ones. The list is not exhaustive, and doesn’t even have all the Orthodox blogs I read. But it’s a start, and anyone who would like to add more is welcome to do so, and to comment on them. If you add a blog, please don’t forget to add the URL so that others can find it. To add a blog, enter the NAME of the blog or web journal you want to add, and click on “ADD”. When it has been added, click on the “Add link” and add the URL of the blog or web journal. DON’T put the URL in the name field, because clicking on it won’t take you to the blog, but only to the description of it on the Unspun site. Items on the list that are not blogs or web journals, or have no links to the URL, will be removed. See the comments below for more information, or if you want to ask questions about this. You can find the list of Best Orthodox Christian blogs here. The West and Nato opted for military rather than diplomatic solutions to the tensions in the former Yugoslavia, which simply exacerbated the tensions. .
South Africa, which abandoned apartheid and had a Truth and Reconciliation Commision, perhaps has a better mo0del to offer than apartheid and UDI. The Russian Orthodox Church has called on Albanians in Kosovo to understand disastrous consequences of the unilateral recognition of the region’s independence. “We would like the Albanian side, which admitted this, to understand that this path is disastrous and to seek reconciliation with Serbians,” priest Georgy Ryabykh, a representative of the Moscow Patriarchate Department for External Church Relations, told Interfax-Religion. Any decision concerning several parties cannot be made unilaterally, as it could lead to the escalation of the conflict, he said. “That is why in case of the escalation of the situation in Kosovo, the responsibility will lie with the Albanian side that dared for this unilateral step,” the priest said. Patriarch Alexy II of Moscow and all Russia has many times stated that the Kosovo status issue should not be solved disregarding the opinion f the Serbian people. Protestants often denounce “tradition” as something evil, and yet tradition is what keeps the church going in times of persecution. In effect, among the victims of the atomic bomb in Nagasaki, two thirds of the small but vibrant Japanese Catholic community disappeared in a single day. It was a community that was nearly wiped out twice in three centuries. In 1945, this was done through an act of war that was mysteriously focused on this city. Three centuries before, it was by a terrible persecution very similar to that of the Roman empire against the first Christians, with Nagasaki and its “hill of martyrs” again the epicenter. And yet, the Japanese Catholic community was able to recover from both of these tragedies. After the persecution in the seventeenth century, Christians kept their faith alive by passing it on from parents to children for two centuries, in the absence of bishops, priests, and sacraments. In the Orthodox Church one saw the same thing in the same country, though in the far north. Fr Nikolai Kasatkin went to Japan in 1861, officially as chapl;ain to the Russian consulate at Hakodate, but in his heart as a missionary to proclaim the gospel of Christ to the Japanese people. He learnt the Japanese language, and gave lessons in Russian language and culture to Japanese who wanted to learn. As part of the lessons on Russian culture, he talked about the role of the Orthodox Church and the Orthodox Christian faith in Russian history, culture and society. Some samurai (members of the military class) heard of this and one of them, Sawabe by name, went to see the Russian priest, accused him of “destroying Japanese culture”, and threatened to kill him if he did not stop. Father Nikolai said, You have not heard what I have said to people. Should you not hear first, before making such accusations? Sawabe agreed to hear, and, having heard, brought two fellow samurai to hear, and became the first to ask to be baptised. But then the Japanese government began to clamp down on Christianity, and so the three scattered to their homes in the country, but as they went they told friends and family about what they heard, and soon there was a flourishing Japanese Orthodox Church. Father Nikolai returned to Russia where he was consecrated bishop and by his death in 1914 there were more than 20000 Orthodox Christians in Japan. He is now known as St Nicholas of Japan. His method of evangelism was simple, and was the same as that advocated by St Paul: “what you have heard from me before many witnesses entrust to faithful men who wil be able to teach others” (II Tim 2:2). That is the essence of tradition (paradosis), and that is how the Church has been able to withstand and survive through persecution at many different times and places.